The future doesn't simply arrive fully formed overnight, but emerges step by step. In The Signals Are Talking, Professor Amy Webb reveals a systemic way of evaluating new ideas bubbling up on the horizon—distinguishing what is a real trend from the merely trendy. 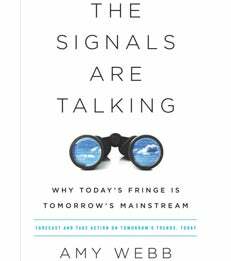 This book helps readers hear which signals are talking sense, and which are simply nonsense, so that they might know today what developments—especially those seemingly random ideas at the fringe as they converge and begin to move toward the mainstream—have long-term consequence for tomorrow. With the methodology developed in The Signals Are Talking, readers learn how to think like a futurist and answer vitally important questions: How will a technology—like artificial intelligence, machine learning, self-driving cars, biohacking, bots and the Internet of Things—affect people personally? How will it impact businesses and workplaces? How will it eventually change the way people live, work, play and think—and how should society prepare for it now?